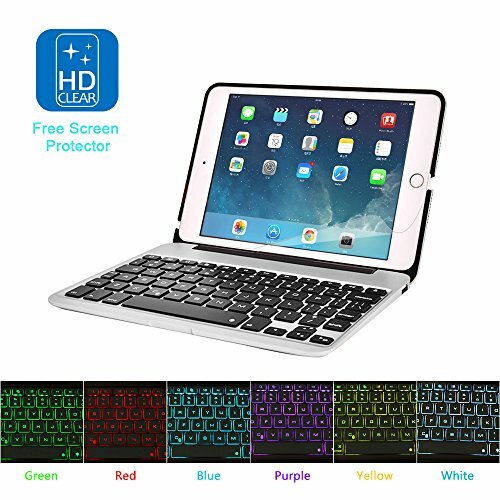 MOSTOP iPad Mini 4 Wireless Bluetooth Keyboard With Aluminum Shell & 7 Colors Backlit Keys, Perfect Friend for Your Traveling & Business & Entertainment! Simple and stylish keyboard with clamshell cover case, only designed for iPad mini 4. Whether you're checking messages while answering email or creating a presentation while watching the big game, exquisite and special function keys help you get more out of iPad mini 4 than ever before. Preserve the keyboard under normal temperature, recharge under normal voltage. If you do not use for a long time, need to timely charge (about one time in two month). BLUETOOTH KEYBOARD FOR IPAD MINI 4: Designed only for ipad mini 4 rather than other model, please check with your tablet's model clearly before ordering. 7 COLORS BACKLIT KEYBOARD DESIGN: In a range of gorgeous colors, which one do you prefer? 7 colors backlit design can provide you different brightness control and bring you different enjoyment. POWERFUL CAPACITY POWER BANK: Built-in 2800mah capacity power bank can charge for your mobile phone and tablets as well other devices. ULTRA SLIM AND PORTABLE DESIGN: Clamshell type of design, the thickness of key only 4mm, super convenient to carry when you are travel or do business in other country.